Just over 10 years ago, David Vitale’s love of craft beer led him to discover the possibilities of Australian whisky. 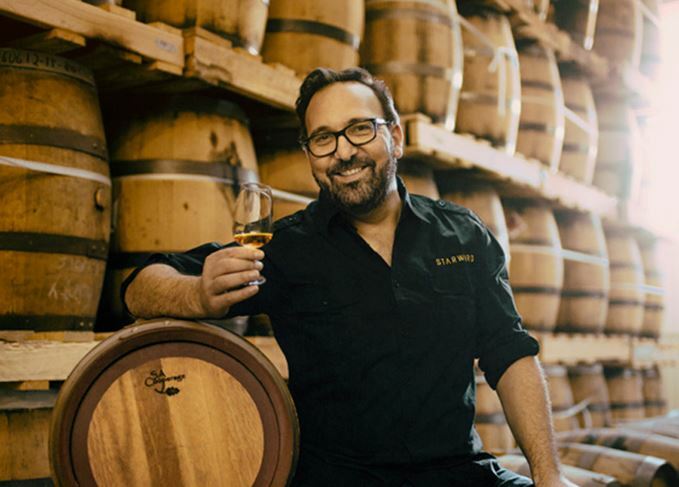 Now the founder of Melbourne’s Starward distillery tells Matt Evans about his rollercoaster of an early career, his expansion to the US and why Melbourne’s climate makes great whisky. ‘My first passion was craft beer, and I made way too much homebrew to drink myself and share with friends. I started thinking about setting up a craft brewery, but at the time I was living in Tasmania and realised pretty quickly good beer doesn’t travel well. So I shelved that idea and bumped into a friend, who said: “I think I’ve got a way you can solve this ‘good beer doesn’t travel well’ problem of yours,” and he introduced me to Bill Lark [from Lark Distillery in Tasmania]. ‘It was a moment of clarity for me, walking into Lark distillery. It was suddenly obvious that all the things I loved about craft beer – provenance and flavour and the story behind it – were evident in single malt whiskies. I realised there’s a place in the world for a great Australian craft whisky. ‘It was a rollercoaster in the early days. As much as we had a clear vision of what we wanted to be – this distinctly Australian whisky that was going to mature in wine barrels – it was still unproven, and it took a lot of patience and belief, not just on my part but those that invested in the idea early on, to even get to market. We wouldn’t be here without those crazy people like me. ‘There’s a whole book of our company’s sink-or-swim moments. It’s one thing to lay away whisky and wait, but at one time we thought: “Perhaps we should diversify, and think about producing a gin to supplement cash flow”. Much to the consternation of the investors saying “this seems like a really sensible way to be more patient,” I was quite belligerent about who we were as a brand. We didn’t want to be a gin company making a whisky. It nearly sent us to the wall, having that single-minded focus, but I’m so glad that we persisted. ‘Australian whisky is still undefined. Australian whisky typically uses brewing barley strains like Gairdner, which means we’re flavour-driven [as opposed to choosing barley for its yield]. We treat the wash like a craft beer in itself rather than a means to an end. When we started, the malting industry wasn’t at a point at which they could accommodate the scale of startup distilleries. ‘Although the use of brewing barley is common throughout all Australian distilleries, the brands that are the most distinctive really celebrate Australian red wine barrels. I love using Barossa Shiraz barrels, because the whisky that comes out of those barrels is not like the wine it makes. I think people link Barossa with big, slap-you-across-the-face, poke-you-between-the-eyes kind of wines, and that’s not what Starward is. There’s a dissonance between what a Shiraz is and what a Shiraz-matured whisky is, which I love. ‘We often talk about this idea that we mature our whisky for three Melbourne years. A lot of people from Ireland and the east coast of the United States talk about having four seasons in a day, but the difference is that we can have up to a 20°C temperature range in a single day, and that can have a profound impact on the whisky. In the summer months the whisky matures quite quickly, and during the winter months it’s probably moving as fast as the summer months in Scotland. It means we’re getting far greater depth and complexity, and a rich, mellow whisky in a much shorter timeframe. ‘We’re trying to get beer drinkers into Starward on their terms, by cask-ageing beers in Starward barrels. We’ll continue to think about ways we can pair whisky and beer. It’s technically challenging. It might be a beer barrel-finished whisky, or it might be a boilermaker. ‘We’ve actually tried a wine boilermaker at the distillery bar, just to “take that for a walk” and see people’s reactions, because a lot of characteristics and notes in whisky are actually familiar to wine drinkers. The fact you’re getting so many of these red wine characteristics in our whisky make it a whole lot easier for wine people to approach it. ‘We almost go out of our way not to be Scotch. We can do the fireplace, but we’re far more comfortable at the dinner table. The dinner table is such an important part of Australian social gatherings, and having whisky at the dinner table is a really important part of that. ‘Every single [Australian whisky] producer makes amazing spirit. Sullivan’s Cove winning best single malt in the world has just lifted the tide for all producers. I think, from my point of view, there are few misconceptions about quality, but we are still really young and struggle to get our share of the market, and that’s a result of the scarcity of Australian whiskies. The big challenge for Starward is to punch a little bit above its weight on behalf of the industry, and say we’re available, we’re not going to break the bank, and to give us a go. Most whisky drinkers are curious, and we’re fortunate to have had this amazing tailwind over the last five years, this huge tailwind of flavour-driven whiskies. ‘Next year we’ll be doing another production upgrade for the distillery which will get us to a production capacity of over 200,000 nine-litre cases a year. We’re launching in the US in August, which is very exciting for me personally. It’s been an ambition of mine since day one to supply the United States, so we’re finally getting there. We’ve got a couple of other products in the pipeline which will be really interesting and should shake up the industry a little bit.